Out of all the old cards I thought would have gotten at least one review, this card had never been looked at. Odd, no? As a general rule, it's not good to give up a card just to do one shot of damage unless there are extenuating circumstances. For example, Poison of the Old Man is a Quick-play spell, so if you set this and the opponent hits it, you gain/they lose AND they lost a card/card effect. Wave-Motion Cannon can get ridiculously powerful if left on the field for multiple turns...but most of the time, you're going to want a card that CONTINUOUSLY does burn damage (Lava Golem, Stealth Bird, Solar Flare Dragon). This card does 500 damage per monster the opponent has, no matter the position. Given that Advanced Format encourages more monsters on the field (even with Mirror Force back, there's still a lot less removal than Traditional), this could do a fair bit of damage. However, there's one card that sees Advanced play that makes this card one of the best single-shot burners out there. Having said that, this is a good card for a Burn deck to have in their deck in Duel 1 and side out for Duels 2 and 3. If you can catch an opponent by suprise with a couple of these and take the first Duel, then effectively side deck out so their side-decking becomes useless, you have a much better chance in a competitive environment. Coin Flip Just Desserts is one of a few cards we've never, ever reviewed. Which is strange. Considering how it's been out since the very beginning of the game, it should have gotten at least the one review. But I digress. 500 for every monster on your opponent's side of the field = 2500 max. This is an odd burn card. On the one hand, if they use Scapegoat (or you use Ojama Trio) then you get a quick 1500-2000 out of one card. This only gets worse for your opponent as the game progresses. Burn really likes it when you fill up your field, because it gives them Lava Golem bait and gives you fewer chances to react. This sort of goes along with that. It's really a fairly solid burn card, and has been since Metal Raiders, when a Magician of Faith or 3 + two Swords + Mirror Force + 3x Waboku + 3x Mask of Darkness made the entire game a large stall-a-thon. Of course, that ended in Pharaoh's Servant, but regardless. It's a great card for a burn deck. One thing about me that some of you may know – but most of you probably don’t – is that I never choose cards for review that the Card of the Day team has already reviewed. That means, surprisingly enough, that the Pojo CotDers have NEVER reviewed Just Desserts. Weird, huh? That said, Just Desserts is a drastically underrated Trap Card for Burn Decks. A mere two monsters on your opponent’s side of the field will let Just Desserts do 1000 damage. Three (Ojama Trio, anyone?) for a guaranteed 1500 damage. Four (and that’s not unreasonable at all, what with Scapegoat being played everywhere) for 2000 damage. The most you could do is 2500, but that’s certainly not a bad maximum at all, especially considering you might actually reach it. Granted, this is a dead draw with something like Jinzo on the field or when your opponent doesn’t have many monsters, but Burners need to take risks like that. This card is a valuable asset to Burn, one that’s been overlooked for way too long and needs to start seeing some play. Whether you use Ojama Trio or just want to rely on your opponent’s haphazard Scapegoat usage, Just Desserts is something you should consider. Our final card for this Burn Week is Just Desserts, an old card that has surprisingly never been reviewed before. JD’s effect is similar to that of Ceasefire; for each monster on the opponent’s side of the field the opponent loses 500 Life Points. It’s a simple effect that has the potential to do 2500 points of damage to the opponent. Of course in today’s dueling environment, most people try to avoid having more than 2 monsters on the field, allowing JD an average of 1000 points of damage. Of course it isn’t fair to you that your opponent’s being all “conservative” and working for the man, so you should, like, use an Ojama Trio. Not only will you give JD it’s full potential, but you’ll give the wonderful annoyances of the Ojama Tokens. All in all, JD is one of the more reliable forms of Burn I can think of, and could be considered a replacement for Ceasefire with great ease. Advanced: 3.5/5. Very well rounded card that can do a fair amount of damage. I reviewed this not too long ago for one of the “Dealer’s Choice” days. Here’s the review I gave then with a few tweaks: Oh, and thanks DarkZray for reminding me why I do this. Effect : When you activate this card, you get to inflict damage to your opponent’s Life Points equal to the amount of Monsters they have on their side of the field. This means a single card can get upwards of 2500 damage, or do zero. Usually, if you know what you are doing, you can get a solid 1000 out of it. This is a solid effect in my opinion. Stats : Just Desserts is a Trap card. Since your opponent will usually be Summoning Monsters on their turn, it’s almost always worth waiting a turn to get another 500 points of damage. The ability to chain or respond to other actions often makes burn cards more potent, like waiting for them to use a card that requires their own LP, and then drop it even further. As such, only a Quick-Play Spell would come close to the versatility. Watch out for Trap negation. Thankfully most efficient Trap negation comes from Jinzo (one-per deck Tribute Monster) or Royal Decree (very pricey Trap card). Combinations : Stall/Burn loves this card. Well, you’d think it would. I don’t see it that much, but it’s a great card if you know how to use it. Just Desserts is a great counter to Scapegoat: they probably bought themselves only two turns without any successful attacks going through… but you just hit them for 2000 in burn damage, what you’d expect to accumulate over those turns had they used other defenses. As mentioned when it was covered February 7th, 2005, this goes great with Ojama Trio. Two cards for 1500 burn, cutting your opponent down to two usable Monster Zones, and the potential of another 900 points of burn. Another useful card to combine it with is Morphing Jar #2: they hit, hopefully having to toss a few good Spells of Traps, and then set as many Monsters as they had (barring them drawing Tributes or the like). So… they loose momentum, and still have a field full of monsters to feed your burn damage. Stall/Burn may not be quite as popular as it was, but it still seems pretty solid, and can definitely make good use of the card. In your normal Stall/Burn deck, your opponent is going to be more or less locked down by things like Messenger of Peace and Level Limit-Area B, so they should have quite a few Monsters. Given that it is a Trap, you actually have an option to get it out quickly: Mask of Darkness plus A Cat of Ill Omen. Such cards are actually quite useful to a Trap oriented Burner. Swarm (via Warriors, Zombies, and sometimes Beasts) is an expected site at tournaments, and results in better damage yields. Just Desserts is a simple, sweet burn card that is unrestricted. Traditional :1.5/5-Given all the field clearing cards, it seems doubtful you’ll get any real damage out of Just Desserts in this format. Advanced : 3.5/5-Players have become more cautious with the return of Mirror Force and the addition of Lighting Vortex. Still, it shouldn’t be too hard to lull someone into filling their field, and they may think that by setting Monsters they are avoiding your Mirror Force, instead of enhancing Just Desserts. Limited : 4/5-Burn damage is great here: its unexpected most of the time. Being Monster based is okay; just make sure you’re hitting them for the kill if you let them fill up their Monster Zones on purpose. Just Desserts: an oldie but a goodie. It’s just so deliciously ironic when you defeat your opponent by turning their own formidable attack force against them. Probably the only Trap that does this better is Ceasefire. 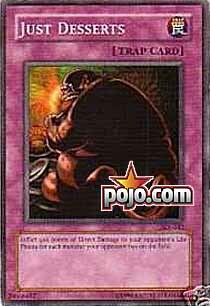 It seems this card has NEVER been reviewed, which is a shame because it's one of my favorite trap cards. If you sprung three of these while your opponent had five monsters on the field, that 7500 lifepoints gone. However unlikely that may be, it still isn't a bad card. It's more than possible to spring this on your opponent. It's a trap, which isn't necessarily the best thing in the world, but using it when your opponent has 2 or 3 monsters may not be all that hard. That's still 1000 or 1500 points of damage. I personally prefer Ceasfire over this card for a couple of reason. First, Ceasefire counts both sides of the field, even though it only includes effect monsters. Secondly, Ceasfire flips all face down monsters yet doesn't activate their effects. This can be quite hurtful to your opponent. *sigh* It seems I've reviewed two cards today. Now, Just Desserts is a solid burn card, and I use to run two back in the olden days. I don't see Just Desserts hardly at all anymore, which is a real shame. It may be worth using for shock value as your opponent may not see it coming ever.